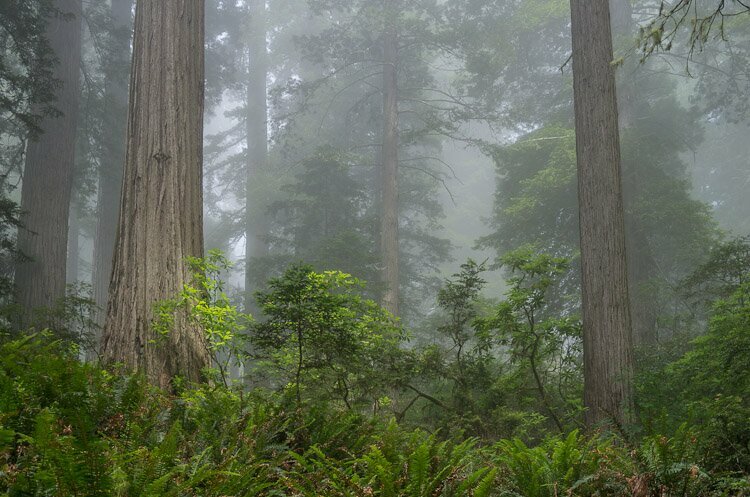 There is no fee for entering Redwood National Park. You may not even be aware you are in the park. There is a visitor center at the south end of the park, just south of Orick, a small, run-down hamlet. Highway 101 turns inland from the vistor center, passing by prairies and streams. Just north of Orick is Bald Hills Road, which will take you to the largest section of the park. 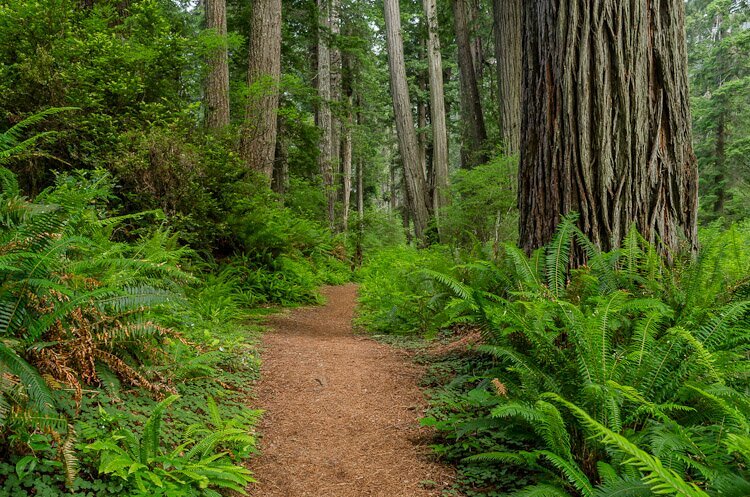 Lady Bird Johnson Grove, the most beautiful grove of redwoods in the park, and Tall Trees Grove (which may—or may not—contain the world’s tallest tree) are the highlights of this section of the park. If you venture further north on Highway 101, you pass the appropriately named Elk Grove (a popular hangout for elk). Other highlights are Davison road, which leads to Fern Canyon, which is run by the state and costs $8.00 to access. Further north along Highway 101 is the turnoff to Prairie Creek State Park, one of the best concentrations of old growth redwoods north of Eureka. From this point, Redwood National Park hugs the coast, passing the scenic ridges that tower over the Klamath River’s entrance into the sea. Several state parks, including Del Norte Redwoods State Park and Jedediah Smith Redwoods State Park, take up most of the land in this section of the park. Early on a Saturday morning I ventured forth with my camera, tripod, and a bag full of lenses, hoping to get photograph redwoods. Summertime on the northcoast means overcast fog. This is not a good time of year for sunrises or sunsets. It’s usually either foggy or cloudless. When it’s foggy, it’s time to photograph trees. Redwood groves are impossible to photograph under sunlight, as the contrast is too great for any camera. But under fog, they can be magical places. Still tricky to photograph, because there’s so much detail and trees rarely arrange themselves into attractive patterns. It might be worth coming out here in the winter, when the ticks are in hibernation and the light is better. Photographing redwoods is tricky and the bald hills can be a tad boring. The best scenery in Redwood National Park is along the coast. But in the summer, with the fog and the overcast, the coast can be impossible to photograph to any advantage. Fall and winter is the best time to photograph the coastal sections of Redwood National Park. In the summer, head for the redwoods and the elk. The bald hills might be worth a brief look, but don’t expect to find anything spectacular.